All persons staying in the danger zone of laser radiation must use an appropriate eye protection. Beforehand, please make sure that the protection is suitable for the intended laser radiation by controlling the abbreviation for the type, the wavelength and the scale number for not hurting your eyes. Laser Protective Eyewear resp. 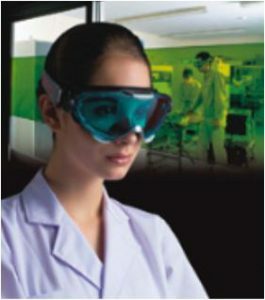 Laser Safety Glasses and Goggles are available according to different laser absorption types. Lens is f. ex. made of Polycarbonate with hard & anti-fogging coating and/or protect your eyes from IPL (Automatic darkening filters for personal eye protection from intense pulse light). High Tec filter shuts automatically after sensing the IPL for the purpose of protecting your eyes. Ergonomic elastomer Cushing gives good fitting and integrated spherical lens enable wide view. Laser goggles protects the eyes against scattered light and diffuse reflection of a laser beam. They provide high transmittance and visibility. Both frame and lens have high damage threshold. Laser Shield Windows are used as a measure to protect operators from laser risks, as it is essential to avoid exposure from laser radiation due to laser emitting equipment. Laser processing machines are most likely to cause a risk due to unforeseen laser reflections. The laser shield window can be used for a variety of applications such as a viewing window, a partition of a control area or an aperture installation on doors. Due to the acrylic material; polymetyl meta acrylate, accurate measurement processing is available. The Laser Shield Curtain is made of plasticized polyvinyl chloride. Therefore, it is soft and flexible making its installation much easier as it can be made into any shape according to its required applications (you can easily cut the curtain by scissors and fit it to the size of any ready-made facilities). It is essential to contain a laser within an enclosed area from a safety point of view. When you isolate the work area from the outside, the outside operators cannot identify the condition of the operators within such an enclosed area and this is not advisable from a safety perspective. The laser curtain not only provides isolation of the laser control area but it also offers peace of mind and safety to all workers which will constitute a safe working environment.